This anthology was created and written by the fans at Rainfurrest. All the writers and artists have waived all fees, so that all the money will go to charity so our furry friends can have a better life. Thanks to our writers, artists and FurPlanet for this dream has come true and we are hoping that we can do more anthologies. The theme of Rainfurrest 2011 was “Furry Camping”, which became the theme of the anthology. 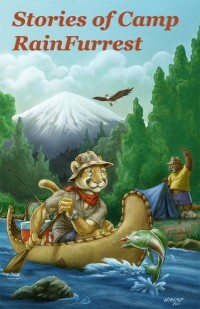 The 108-page Stories of Camp RainFurrest contains eleven short stories; two are illustrated, and two have been included on the 2011 Recommended Anthropomorphics List. “Creation of Camp RainFurrest” by Gene Armstrong is a three-page short-short that sets the theme. “Home Sickness” by Sorin is a practically generic tale of the reluctant loner kid (otter) who is positive that he will hate camp, being wooed out of his sulks by his enthusiastic bunkmate (red fox). “Within Our Nature” by Garrett Biggerstaff is narrated by T.J., the camp cook, the only predator (unspecified feline) in a camp of prey species. He is only there because his boyfriend (stallion) is the head counselor. He expects to have a boring time not getting caught smoking and trying not to inadvertently scare the prey kids, and is happily surprised when a nerd kid (beaver) turns out to have more guts than he shows. In “All Are Welcome” by Ryan Hickey, two separate groups are encouraged to come together in friendship: a Summer camp of predators with one nervous prey (mouse) boy, and three older teen counselors (wolf, bear, and cheetah) who are friends but have just discovered that they are rival gay lovers. “Salute the Flag” by Kandrel pits a secret cabal of indignant barely-adolescent campers (feline, squirrel, ferret, and fox) as the Committee to End Oppression against the scowling older-teen Counselor Stevens (wolf) who wakes everyone in his cabin at 5:30 a.m. and confiscates campers’ candy. Sixteen-year-old Zala’s confusing adolescent growth is manifesting in her turning into four beasts at once. She hopes that a session at camp with other young shapeshifters will help her decide what animal to become. The protagonist of “First Time at Camp” by James Stringer is James, the son of a blue tiger father and a black wolf mother, who is always being hassled by adults who think his weird fur coloring is punk-dyed and that he is a troublemaker. James meets Rain, a young cougar who accepts him for what he is. “Where the Heart Is” by Mary E. Lowd keeps to the camping theme but does not feature any Earthly camp. Four friends at the interstellar All Alien Café, a Woaoo (koala), a Heffen (red-wolf), a Srellik (long-tailed green lizard), and a Lintar (large blue fish whose head is in a water-filled diving helmet), decide to take a vacation together in the Srellik’s spaceship to the Woaoo’s home planet, to the forest where she used to camp out as a child. In “‘A Few Hangups’” by Trey Jackson, Julian (cougar) and his girlfriend Edith (rat) go wilderness hiking together in Forestalia. Julian finds out that you can’t rough it and be a million-dollar wheeler-dealer via cel phone at the same time. In “Antebellum” by Garrett Biggerstaff, Malcolm, a drafthorse colt, reminisces about his previous stay at camp where he became best friends with Mike, a cat, and the other pals he developed, Ian (bull) and Aaron (regular horse). Eleven stories. Eleven variations on a theme, some more imaginative than others. On the whole, this is a project worth supporting. And it will be repeated, because Rainfurrest has announced that it has been a big success. Rainfurrest 2012’s theme is steampunk and weird/mad science. The deadline for 5,000–8,000 word submissions has already passed. The second convention anthology will go on sale at Rainfurrest 2012, 27–30 September at the Hilton Seattle Airport & Conference Center. I would like to see each convention kind of develop to their own niches, I mean having the general stuff is good and all, but if each could focus on a particular aspect that they could separate themselves from the rest, that would be interesting indeed. To an extent, they already do. In part this is a factor of where they are based; each area has its unique nature. For example, Califur's Cabaret Fur Le Dance - previously a feature of ConFurence - represents a certain tone that would not be felt at, say, Anthrocon (I understand Mephit Furmeet is somewhat similar). As we have seen recently, some conventions restrict certain purchases that others allow; this is not a new situation either. The same could be set for websites. Inkbunny has some content that FA will not (now) touch, and vice versa. dA restricts even more.
" forcing everyone under one roof is a recipe for drama"
Or more simply put, high school. My high school had multiple roofs.